New year, new renovation projects! If 2018 is finally the year to upgrade your services and include new tiles in the range of options you offer to your customers, well, you couldn’t have picked a better year to start. Current tile trends that are in right now aren’t just chic and stylish options that can replace dull white tiles, but they also offer homeowners great variety. Sure, you might be inclined to offer your customers a classic black-and-white model for a bathroom floor, or a neutral colored floral for the walls and call it a day. There’s a reason they’re called a “classic” – they never go out of style, right? But they’re just so familiar that homeowners are growing tired of them and want something that will allow them to stand out and personalize their space. After all, you can spot these models in friends’ houses, restaurants, or even some fashion-forward gas stations. Give your customers the possibility to diversify things a little and choose something with a bit more creativity. The tiles on the list already started growing in popularity in late 2017, and they’ll surely make a splash in the new year as well. Don’t worry; they’re not extravagant pieces that will insult your customers’ eyes every time they enter their bathroom. They are modern, stylish, and chic. So, here are the tile market trends that you should consider in 2018. What to Expect from the 2018 Tile Trends? It can be easily overwhelming to choose the best tiles to offer to your potential customers. After all, it’s not like you’re going to restock your inventory every other few months; you want something long term. For that, the best thing to do before making any decision is to study the market carefully, and see what’s in and what isn’t. You might already have something in mind, but keep your options open. In 2018 you can expect a lot of the classic tile trends to suffer a few tweaks here and there. Old-timely styles are getting updated and mixed with modern colors and elements, and that is very good news for your business. Just think about the many possibilities you can offer homeowners and prevent their floors or walls from looking like a carbon copy of someone else’s. Regarding materials, ceramic floor tiles are still the most popular of the lot. It’s easy to see why they’re versatile and fairly easy to cut with the right tools. 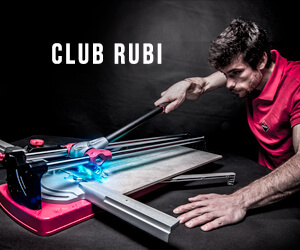 We recommend RUBI tools, such as the TZ Tile Cutter, which is the most advanced manual tile cutter you can get your hands on if you want to get creative with your cuts. With that in mind, let’s take a look at some of the most popular tile trends you can expect to see in the new year. Forget about plain models in 2018. This year’s tile trends are all about texture, both for wall or floor renovation. Most of these materials can add a lot of depth to your customers’ rooms, and the most popular ones come with naturally random patterns, like nature itself did your tiling. Pick some in neutral colors, white-based if you want to offer a modern look or brown-beige if your customers want a rustic-vintage sort of vibe. Marble tiles will never go out of style. This material has been around for ages, first as the go-to basis of renaissance sculptures, and then as a durable option for tiles. They’re easily the most timeless models of the list and, perhaps, one of the most durable and versatile to use. What’s more appealing is that they’re easy to maintain and clean, so your customers will be more than happy with the material you’ve recommended. These tiles come in a wide variety of colors, are mostly used for flooring, but you can easily cut them with the RUBI DC-250 tile saw and make a lovely wall pattern. Multi-sized (or modular) tiles are a great way to create a more playful look if you’re over that whole symmetry thing. This tile trend lets you create one of the most striking designs for your customers’ floors. You can think of combinations made up of two, three or even four tiles, and they come in multiple styles, such as porcelain or terracotta. The number of tiles you choose for your combination will determine the general look of your patterns. It’s also possible to play around with different shapes, as long as you make sure to take all the right measurements. We’ve already said that floral designs are a classic tile model, but 2018 will see a beautiful upgrade of this popular trend. In a way, botanical is the new floral. Think of it as if you’re getting a piece of Mother Nature’s greens indoors, with tiles that incorporate beautiful botanical themes. Some designs even look like they’ve been hand painted, giving the floors and walls a nice handmade touch. This trend will create one big picture with multiple tiles, making use of white space to give the illusion of more space. Variations of black or other darker tile colors will express the idea of luxury, and who doesn’t what that? It’s fairly common for people to shy away from dark shades out of fear of making a room look smaller or improperly lit, but don’t let that stop you from including this tile trend in your inventory. The key here is to create a sense of contrast, so if your customers are opting for a black tile, recommend them to place it in one of the brighter rooms or one that already has lots of whites and pastels. There should also be a sense of symmetry – a black spot needs to have at least two corresponding lighter spots, so the room doesn’t come off as too dark. Another tip you can integrate is to place dark focal points in the room through a combination of light and black tiles. Terracotta has a bad rep, but that’s going to change in 2018. This “blast from the past” 70’s look is getting a rebrand, so expect to see a lot more from it. It’s a great option if you choose a hexagon shaped tile in pastel colors to give a project a more retro look, with modern stylization. 2017 was dominated by pastel colors, especially in fashion. You can expect them to pop up on your tile selection as well. After all, they’re the natural alternative to boring white tiles and homeowners are likely to jump on the bandwagon. Pastel creates a beautiful, calming effect, and the palette goes far beyond the infamous millennial pink. Recommend your customers to opt for lavender or turquoise shades for a subtle dash of color. Tiles that give the impression of wood aren’t necessarily something new, but it’s one of those tile trends that are here to stay in 2018. The available patterns continue to change, from symmetric squares to intricate puzzles. Its effects are refreshing, a statement piece of naturalistic chic. There’s a lot of love for the industrial look in 2018. Tiles that recreate the look of exterior concrete walls or factory floors might not be for everyone, but anyone who wants to make a bold statement will consider these models. So, make sure to include them in your offer. In 2018, homeowners don’t want to have to choose just one type of material and stick to it. All these different effects (natural, concrete, wooden, marble) are at their disposal, and they want to play with them. Don’t stick with uniform models, but mix and match materials so that they meet the needs and preferences of your customers best. Metallic tones haven’t been very popular in the past years, but they’re becoming more and more trendy in 2018. Copper hues or other metals give a kind of unexpected wow factor, and they go well in different rooms of a household. Mixing matte tiles with more shiny hues can create a gorgeous contrast. Place them on the walls of the bathroom, either covering them entirely or creating a pattern of mixed tiles. The light will make the glam tiles shine, while the matte ones will give the illusion of different shades. First thing’s first, let’s establish right now that ceramic and porcelain mean two different things when it comes to tiles, though there are some similarities between the two. For instance, ceramic floor tiles are typically used indoors, as the material is softer and, therefore, easier to cut than porcelain. But in 2018 you’ll see a more significant shift towards ceramic tiles, mainly because they are a lot more flexible and allow greater design creativity. The right tile saw can do wonders with your ceramics tile projects, so make sure to choose yours wisely before a new job. The best term to describe 2018’s tile trends is no doubt versatility, as the consensus seems to be that tiles don’t have to be boring – they can add depth and creativity to the indoors. Not to mention, there seems to be a trend for everyone, from the classic retro to rustic chic or a romantic palette. Update your inventory with different materials, colors, and pattern and don’t just settle for those safer options. Your potential customers will appreciate, and you’ll get to have fun putting your creative muscle to work. Groutless Tile Installation: Can You Tile without Grout? cure and so it’s with tile cleaning as well. The content on Tiling World is brought to you by Rubi Tools USA, the leading manufacturer of tile laying equipment and related building tools in North America. Do you want to contact with us?